The whiteboard is a staple addition to most classrooms or conference room these days. And while they are a reliable, and convenient way of sharing ideas, things have moved on since the introduction over 60 years ago. From dry erase wall paint, to electronic smart boards, to simply easy wipe desks; depending on the learning / working environment, there’s a ton of alternative options to a whiteboard that could be explored. Dry erase wall paint is an excellent alternative to the whiteboard. Just ask Silicon Valley where seemingly every other startup paints the wall of their offices with the dry erase, (that’s in between the graffiti of course). Facebook for one have jumped on the bandwagon. It is easy to see why. Cheap, funky and easy to apply, you can literally turn any type of wall surface into an area where ideas can be shared with a pen. Appropriate for both work place and the classroom, it doesn’t matter if you plan on covering a small section of wall, (the size of a whiteboard for instance) or the entire office space, there’s a solution out there for your needs. We carried out an in depth study on some of the best dry erase wall paints here. The box below gives details of what we found. If you’re looking for one of the trendiest alternatives to the whiteboard, dry erase paint is probably it. 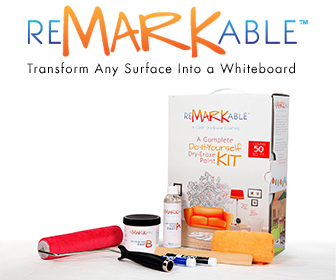 Similar to dry erase paint, only it is transparent and is actually applied as a coating to existing painted surfaces, whiteboard paint is another great alternative. Simply paint your area of wall, desk space or floor with this hardwearing acrylic style coating and the surface will become writable. Most important of all, it is easy to wipe away too. The application is of course endless, and very much down to your imagination. An office floor with whiteboard paint would definitely be an interesting prospect. Essentially, the more dynamic surface you coat, the more unique brainstorming sessions could become. Suitable for the classroom too of course. If your budget stretches to it, the electronic smart board is a very sophisticated alternative to a whiteboard. Many act just like a tablet, but in a much larger form allowing you to swipe your fingers across the surface of the screen to move objects, as well as write directly using a special pen. The technology does cost a lot however. So you will want to do your research. To that end you can read our electronic whiteboard review round up here, or check out the box below for a summary of our findings. Yes, that’s right, you can now buy whiteboard wallpaper as an alternative to the good old whiteboard. While clearly not as convenient to begin with, (who in their right mind enjoys putting up wallpaper), however once it is set and in place, you can enjoy writing all over the walls in the knowledge that you can wipe it all a way in an instant. (My children’s bedroom could do with some of this). After fitting a room with whiteboard wall paper you will need to wait at least 24 hours for everything to dry. After that you will benefit from a non-ghosting surface which will last you a long time. Magnetic boards are a great alternative to whiteboards, however let’s not kid ourselves here, they are very similar. The design and look is the same, you are still mounting a large board that will be written on and wiped after use. That being said, with them being so easy to install and readily available the magnetic board had to make our top 10 list. Suitable for both office and classroom, however boring the prospect might be.